Going All Out with A Regal Chinese New Year Feast! 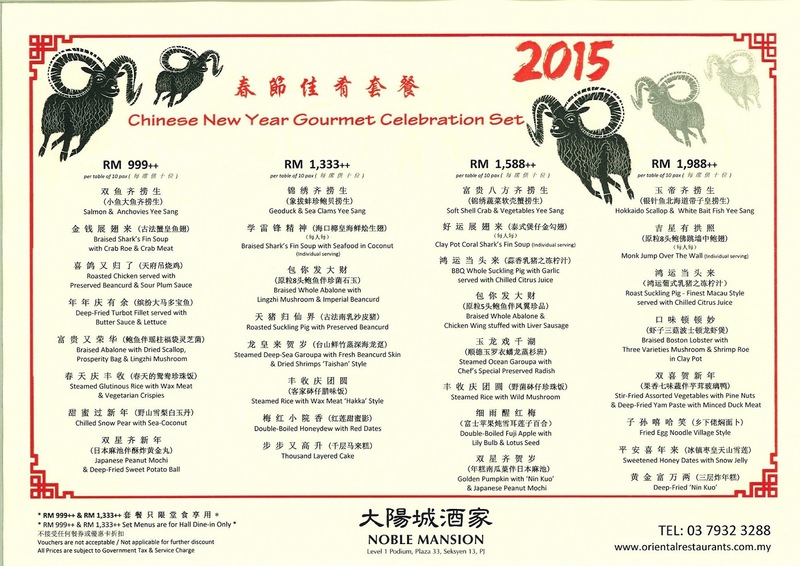 If you are looking for an extravaganza feast this Chinese New Year to usher in the Year of the Goat, look no further as Noble Mansion at The Plaza, Jaya 33 is the perfect venue for a regal feast. 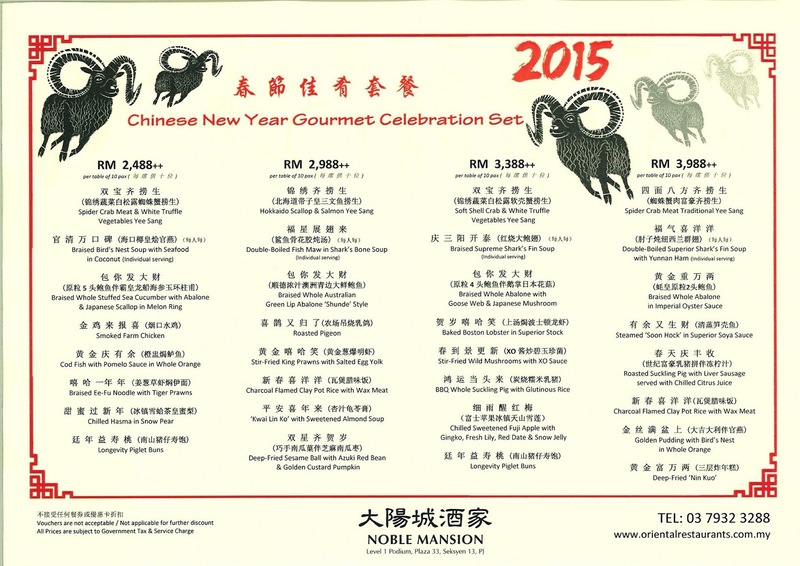 Noble Mansion is part of the esteemed Oriental Group led by the award winning Executive Chef Justin Hor. This restaurant is also the most stylish Chinese restaurant in the group. Opened since 2013, Noble Mansion has been dishing out premium Shunde-style cuisine to many gourmands. Known for their impressive dishes, ambience and services, Noble Mansion is truly a force to be reckoned with in the F&B industry. It’s my first visit to Noble Mansion and nothing prepared me for the regal experience that I was about to experience. I have been to other Oriental restaurants and had unforgettable dishes and yet, I was thoroughly amazed and impressed with Noble Mansion. 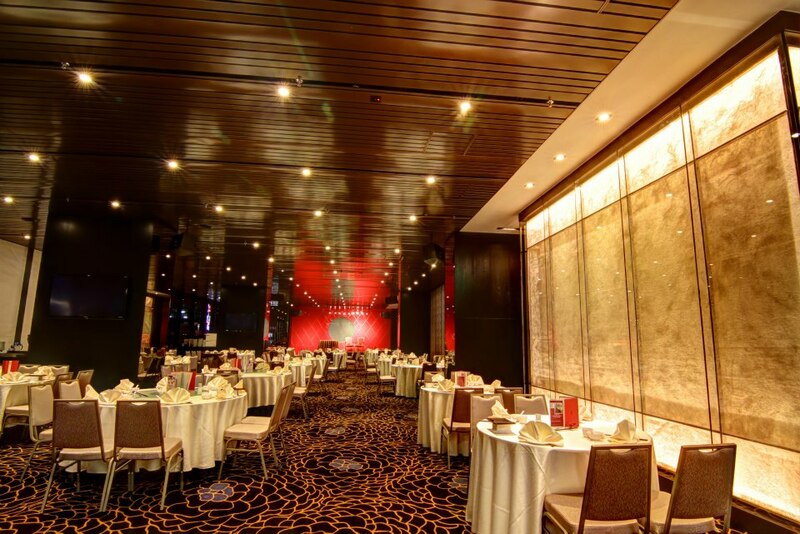 The moment one walks into the elegant restaurant, one will be impressed at how spacious and elegant Noble Mansion is. The modern design of the restaurant features contemporary designs throughout the space, creating an air of luxury and fine-dining ambience. The restaurant is cleverly sectioned into Bamboo Courtyard, the Lantern, the Terracotta Rooms and the Grand Hall for privacy in mind. Chinese restaurants do get pretty loud due to the nature of our Chinese culture. Then there are also those who love to karaoke when dining. So Noble Mansion cleverly caters to all with privacy in mind. Executive Chef Justin is renowned for his foresight in creating dishes that takes Chinese cuisine into a world of endless luxurious deliciousness. He has garnered quite a few distinguished accolades under his belt and continues to take Chinese cuisine to new heights with his constant travels in search for inspirations. I was here for a festive purpose and this year Noble Mansion is going all out and bringing premium to another level of exclusivity. There are plenty of festive set menus available and also a la carte dishes as well. We got a sneak preview of some of the luscious new festive dishes available at Noble Mansion this season. Dinner commenced with the obligatory Yee Sang and ours was enhanced by a highly prized Western ingredient of truffle. Yee Sang with White Bait & White Truffle represents East meets West where white bait is a much beloved Chinese ingredient and truffle is favored by the West. Since its launch of the white truffle previously, I was told that it’s back again this year due to requests. The salad is filled with abundance of textures of crispy white baits, crispy vegetables, citrus peels, raisins and crunchy Pok Chui. Flavours are further enhanced by the white truffle powder together with tangy sweet dressing, crushed peanuts and sesame seeds and sweet bursts of raisins instead of the usual pomelo. The white truffle gave a soft refined earthy aroma which is pretty unique. A bold move in combining flavours! When the Braised Whole Sea Cucumber with Abalones & Scallop in Winter Melon was placed on the table, everyone was in awed. 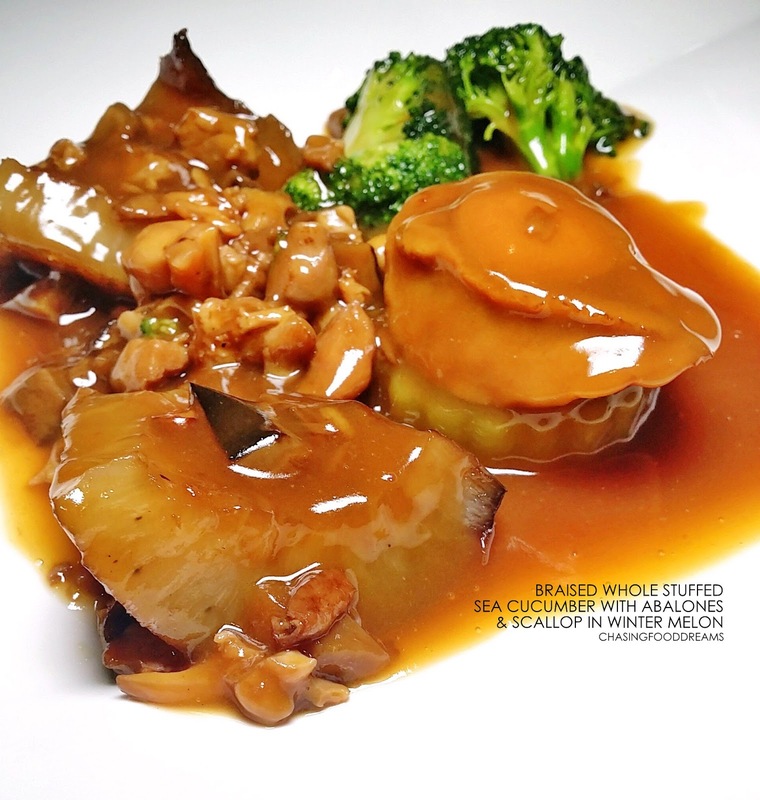 I have never seen such a huge piece of sea cucumber that is brimming with loads of goodies and is accompanied by resplendent whole abalones balanced on winter melon. If you are out to impress, then this dish certainly takes the cake! This dish alone has so many extravagant ingredients of abalone, sea cucumber and scallop that anyone who savors this dish will be feeling very regal. The thick gelatinous sea cucumber is heavenly and well-braised till just tender. It is accompanied by a rustic minced dried seafood, mushroom and gingko nut filling. The abalone had signs of slow braised as it was gorgeously tender and yielded to a light cut of the knife easily. Winter melon is stuffed with a whole dried scallop and cooked till tender and sweet. All the lavish ingredients are then brought together with superbly rich abalone sauce that gave the whole dish its luscious savory and umami flavours. For a moment, I thought I was in heaven as each moment of savoring was so satisfying and sinful. Rest assured, there was utter silence when everyone was savoring this dish as they were in their own heaven! The next dish was Roast Duck with Plum Sauce & Crispy Rice. Duck seemed to be a favorite these days and this one is executed with a flawless touch. The skin had an even and impeccable rich lacquered amber hue. Each bite was a contrasting note of crispy and aromatic skin with dark tender meat. The duck was so well-seasoned, it didn’t really needed any extra sauces. What I thought to be very enjoyable was the rice crispies. Normally it would be crispy rice vermicelli but Chef Justin has cleverly swapped it with the extra crunchy and lightly sweet rice crispies that worked so well with the duck. Just when we thought it couldn’t get any better than the earlier courses, we had a huge Steamed Ocean Garouper with King Prawns, Stuffed Clams, Squid Balls & Angled Loofah in Casserole served to us. Literally a signature seafood fortune pot, this is the gem of the sea in one pot. Steamed Ocean Garouper that has been filleted into thick chunks which made devouring this easy. Accompanying the fish is sweet king prawns, bouncy squid balls and very delectable stuffed clams in half shells. The usual supreme soy sauce also has a good twist with the addition of black beans, dried shrimps and tiny cubes of crispy salted fish that evoked more delicious sensory notes. The flavours leaned more towards savory with a moreish note that will have one keep going back for more. There were also soft pieces of Seng Gua to soak up the delicious sauce. We really enjoyed the sauce and would have loved to have a bowl of rice to go with this dish. It’s another auspicious dish that is all set out to impress and impressed us it did! The feasting continued with another King Neptune’s treasure of Braised Boston Lobster with Shrimp Roe & 3 Varieties Mushrooms. What Chef Justin did here is lightly enhancing the crustacean with more oceanic flavour and aroma while retaining its natural sweetness. To bring the dish its humble earthy flavours, Shitake, button and Enoki mushrooms are sautéed with the crustacean. A generous sprinkling of shrimp roe and citrus peels completed the dish. When something is good, it’s just GOOD! Despite having reach my zenith point, the moment I saw Steamed Rice with Waxed Meats, Hakka Style, I knew I had to have a taste. Taking on a different route, the rice is steamed in earthenware instead of the usual cooking method. It is then crowned with a generous portion of preserved meat and sausages with sautéed French beans. Fluffed them all together with a drizzle of sauce and one gets a steaming bowl of light and fluffy rice perfumed with the essential oils of the preserved meat and savory soy sauce. The rice is really light and flavourful. I like how the French beans lighten up the heavy preserved meat and sausages, making the rice easy to enjoy sans the guilt. The regal feast ended on a high note with Golden Pudding with Bird’s Nest in Whole Orange and Deep Fried Nian Gao. Perfect for CNY, the whole orange encased a wobbly orange scented pudding crowned with double-boiled bird’s nest. Each spoonful is beautifully festive with the orange flavours coupled with the luxurious bird’s nest. The Deep Fried Nian Gao is also yummy with a lovely crispy rice paper encasing soft gooey New Year cake. This is one of the most extraordinary CNY feasts that I have had this year. 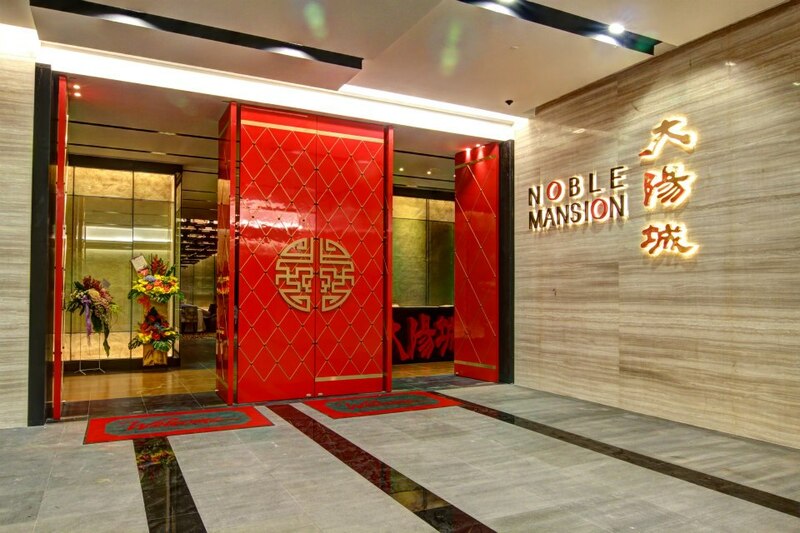 Noble Mansion offers luxurious Chinese gastronomy cuisine filled with creative nuances. Though it comes with a hefty price tag, dishes here are of premium quality and portions are generous. The restaurant specializes in showcasing Chef Justin’s latest creations. Noble Mansion offers an impressive and luxurious dining experience perfect for pampering this festive season!